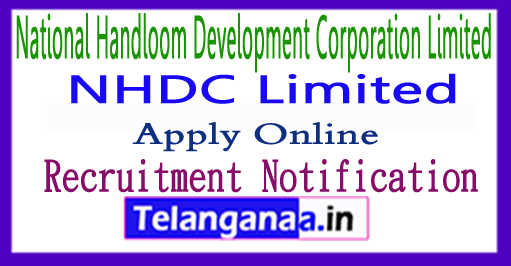 National Handloom Development Corporation Limited has issued a latest advertisement in the form of NHDC recruitment. The organization invites online oriented and skilled job seekers from online application to fill 05 uncertain posts of DGM, Manager, Assistant Manager, Senior Officer in various oriented areas. Job seekers who want to apply for NHDC jobs. They have to submit the form through online mode before the expiry date of 7 November 2018. Job seekers can collect the remaining information about NHDC recruitment 2018 from this page, which is well designed by the experts of www.telanganaa.in. Eligibility Details: Those candidates have the minimum qualification because the candidates desiring to apply for the NHDC jobs should be recognized by the BCom / Mcom / CA / ICWA / MBA (Finance) / PG Diploma (Financial Management / Financial Planning) May apply. Candidates applying for the above post and belonging to the general / OBC category, they have to pay the application fee. 300 / -. Scheduled Castes / Scheduled Tribes / PWD / Internal candidates will be exempted from payment of application fee. How much will I get in the form of a pay band ? : DGM, Manager, Assistant Manager, Senior Officers will be appointed for the posts. 36,600 - 62,000 / - (post 1), Rs. 24, 9 00 - 50,500 / - (post 2), Rs. 16,400 - 40,500 / - (post 3), Rs. 10,800 - 24,500 / - (post 4), Rs. 9 000 - 21,000 / - (5 posts) which are offered by National Handloom Development Corporation Limited. Engagement of applicants will be completed against this recruitment on the basis of their presentation in written examination and group discussion / interview, which will be organized by the recruitment panel of the organization. First, visit the NHDC web portal, which is http://www.nhdc.org.in. A list of this latest opening link will open and the candidates will have to select the most appropriate link, which will open the entire advertisement containing more information about NHDC vacancies. Candidates should take a printout of the deposit application form and send the application form with all the relevant documents at the address given at the address given below. The date of online registration of the application is to begin: 08-10-2018. The last date for submission of hard copy of the application form is: 07-11-2018. For Deputy Manager : Chartered Accountant from the Institute of Chartered Accountants of India / Cost Accountant from the Institute of Cost Accountants of India / MBA with specialization in Finance (Full Time 02 years) from a University recognized by University Grants Commission/Institution diagnosed with the aid of AICTE OR CA/ICWA(CMA)-Inter. For Company Secretary : Associate Company Secretaryship / Fellow Company Secretaryship. For Chief Manager : Degree in Textile Technology / Textiles Engineering from a University recognized through University Grants Commission or All India Council of Technical Education. Selection Process : Selection could be made on thru Interview. Application Fee : Candidates should Pay Rs three hundred/- via Debit Card/Credit Card/Internet Banking. No fee is payable by means of SC/ST/PWD applicants. How to Apply : Interested candidates can also apply online via the website www.Nhdc.Org.In from 10.01.2018 to 10.02.2018. Assistant Manager - Post Graduate in English with Hindi as a subject in Graduation level OR Post Graduate in Hindi with English as issue at Graduation level. Officer - Master of Business Administration (Full Time 02 years) with specialization in Personnel Management OR HR/ Master of Industrial Relations & Personnel Management / Master of Personnel Management / Master of Social Work (MSW) from a University diagnosed. Selection Process - Selection can be made on through Written Test, Group Discussion & Interview. Fee - Candidates should Pay Rs 300/- via Debit Card/Credit Card/Internet Banking. No rate is payable with the aid of SC/ST/PWD candidates. Interested applicants may observe online thru the website www.Nhdc.Org.In from 04.08.2017 to 21.08.2017.